MUFF WIGGLER :: View topic - Waveform City 300 Series? Anyone selling one, or any likelihood of them ever coming back into production sometime soon? I personally have a great love for that module, as well as for the system itself. I've recently delved deeper into electronics and have been working solidly on something in the shape of the Waveform City, but with the capacity for self generation of harmonics rather than the previous system of stored wavetables. I've had to take a breather from the project as it was all getting a bit too much! Phase Locked Loop analysis is not unlike self harm. Anyways so far I have the least imperfect sine and cosine generator ever conceived by humankind as a starting point, with complex digital stabilization of the state variable equation that forms the (analogue) oscillation. This is naturally followed by a low quality digital waveshaper that is a little like a wavefolder. 10 bits with complex harmonic control (think JAG corners). I don't know how the last part will pan out but I'm shooting for bank 12 morphing lovely sines towards Noisering esque chaos and shimmering crystalline lattices under (mainly!) user control. FM ability is a primary concern. I think it will need a 90 degree phase shift normalised to the cosine FM input for backwards compatability. When this has progressed to a fully formed idea and not just the ravings of a madman it shall be submitted to the blue monolithic offices for their consideration. Or it may find it's way behind a 6U panel via other channels. It definitely sounds like an interesting project. I've never used the Waveform City but I've been a huge fan of PPG use of wavetables and the older waves are amazing machines. Anything that can bring that concept and palette into the Wiard world would be a good thing! 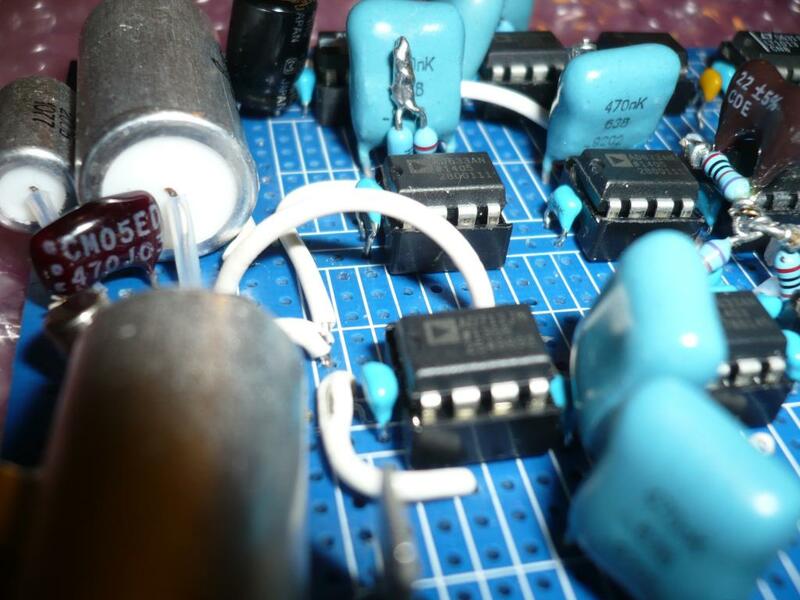 I think the WFC has something that newer oscillators do not, the high quality VCO core designed for linear FM makes possible some unique options, and actually the lower resolution has an interesting tonal character. I'm a purist and I think expanding beyond the wavetable into real time calculation, but keeping the tonal possibilities would be a Good Thing. Thanks for the encouragement. I will keep working on it! Quite far away from any serious thoughts regarding production but the skeleton is knocking around. Just to add - the standard waveform city ROM (ver 2 I think) is not very PPGish. It's great and I use it alot but it has different wavetables. The standard miniwave one is more PPGish and the Grant Richter PPG/VS ROM more so. Even with that though I find that PPG/VS ROM in a miniwave alot less PPGish than you might expect - the sound is I find a little thin in the way the software version, the Microwaves and the PPGs themselves weren't (or even a Virus B for that matter). Not quite sure why that is. with all due respect I think that the stopping of the waveform city module production kind of lessens the wiard synthesizer and makes the most interesting module in the system unaccessible. the waveform city should still be in production in my opinion. it's an important module. I respect completely the decision to cease production. The Wave256 software used to generate/translate the ROMs has a problem with phase alignment so to bring the module in line with the new higher standards that are being brought into the format would have been a far from insignificant undertaking. Plus EEPROMs , the converters that are used, and various other things don't really have the legendary status (or cost effectiveness) that the W300 is known for when compared to some modern wavetables oscillators, for which the E350 has really set the bar high. Gears are being turned to adjust this discrepancy. @OP, send me a PM. Can't promise anything yet but there's a chance. The WFC doesn't sound like a PPG in general, but it's of course much more versatile in terms of VC I/Os. Idk, wiard isn't synthesis technology. isn't that sort of like saying wiard should stop making the classic vco because make noise made the dpo? Idk. I know what you're saying, but Wiard as a company is not being approached as a historical excavation, it's a living growing being, and the WFC is a dodo. But maybe it's possible to inject some new DNA into the fossil. Yeah Michael Chrichton science fiction is an abomination, and you have my sincere apologies for the crassness of this metaphor. Sorry, I don't buy the dodo argument. Malekko didn't work for years to release the Megawave in collaboration with Grant (which we know from Josh and others is not undertaken lightly) just to resurrect a fossil without a market. The Blacet Miniwave is still selling. And Darwin's old programs are pretty neat, although certainly not perfect and of course looking dated. But speaking of dated, the wave256.exe is not a *necessary* tool to create new EPROMs. Lots of modern software around that will get one similarly far. Actually I even used Cool Edit 96 to good effect (just copy one "cued" 256 sample cycle 256 times, IIRC). I love the Waveform City. It can be noisy as hell with attenuated inputs (as in waveshaping), and I can't get my two WFCs to produce the same sound due to different DC offsets in the waves and the VCA, but the synergy between them is all the richer. And the noise has provided me with some unexpected but very welcome sounds of its own. I did think about getting Megawaves instead, mainly because of the WFC's loss of the Classic VCO's brilliant PWM waveform, but when Paul wrote me I couldn't use my own waveforms with the MW, the decision was clear. Also, and my bad I almost forgot this: there were serious attempts at expanding upon the WFC concept ten years ago. It first resulted in the PSIM-1 (Programmable Synthesizer Interface Module, you guessed it), which died because the guy who implemented Grant's software design in the module dissappeared (overextended himself or whatever, no idea). About 40 were sold over five years or so. The resolution is much higher than in the WFC, it has four I/O channels and a Run/ Stop command that even makes it suitable for functions like ADSR envelopes, but it's processor based and the response is a little slow, so not optimal for audio or fast CVs. Then I think Grant, Dave Brown and some others developed the CVS (ComputerVoltageSource), which was a DIY project with potentially more channels and a faster response, but never marketed, to my knowledge. 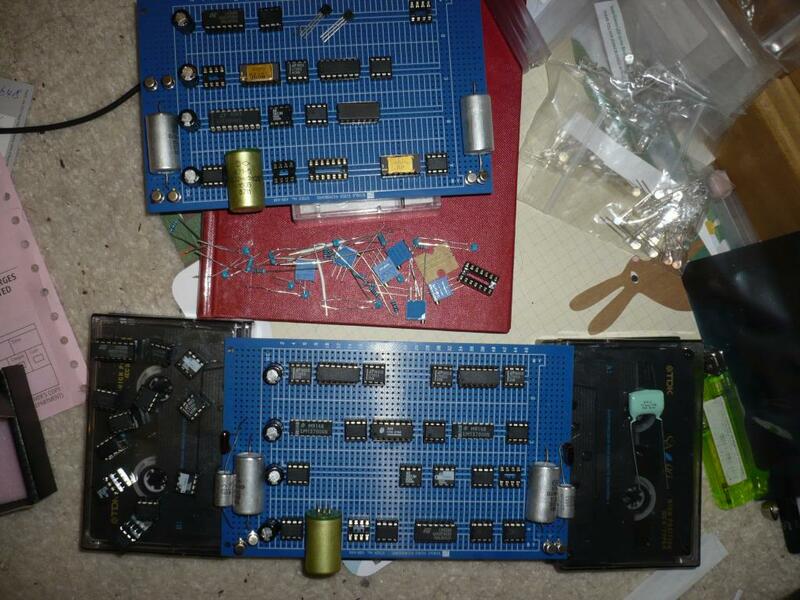 If anyone has a complete (or close to complete) CVS kit or a finished and working build, I'll happily trade a Wiard Waveform City and/ or some cash. Oh, and the PSIM and CVS do not have any VCO/ VCA/ slew limiter/ jack mult on board like the WFC, they're just transform function thingies like the Miniwave but with more channels, more capabilities and more requirements (the functions are to be written in BASIC and transmitted via serial). I don't know how much of those years releasing the Megawave were spent on painstakingly detailed research and design and how many were spent pestering Grant to release the schematics (though I could hazard a guess at the ratio). Actually in doing my research over the last 6 months, which have been really intensive, I have found that there is very much still to be explored with electronic design that not many have really touched at all yet. At it's foundation Wiard has always been about furthering the art, why lose that now? Don't get me wrong I love the WFC too. The other important issue is the fact that these devices are very exposed to the global industry of parts. Releasing an x year old design can cost twice the price, with half the quality, and stay in service for half the time. BTW what you wrote about quadrature waveforms and the Bank 12 to Noise Ring thing sounds beautiful. I like the WFC's harmonic series banks the best (being a fool for additive synths in general), and the Noise Ring's audio second best of the raw waveforms in my Wiard. I'm quite sure to buy a hypothetical new Wiard 300 module, whether it's by you or by Cary, but the unreleased module I'm currently wishing most for is Grant's Noise Ring expander/ "Cybernetics" module. Keep us posted about your research. Thankyou for the kind words. Unfortunately at the moment it is just in my head! There's a lot to be done yet, but I have spent 6 months working on it and don't plan on giving up yet. (But obviously we all know the problems with "vapourware"). Yep the additive morph was the one that I kept on returning too. Like you I also found huge depth in the Noisering, although it didn't quite have the necessary provisions for 1v/Oct of Linear FM. OK now I must get back to the land of vapour and hypotheticals. 100% analogue harmonic series generator. onboard 0% distortion modulation sin oscillator with reciprocal (1 divided by sin) ish waveshaper. I thought it may be valuable to provide more background info. In my research into real time waveshape calculation, I eventually reached a point where older analogue methods were far more useable and interesting. Most of my research has been into 60s analogue computation theory, which was overlooked at the time by Moog, Buchla etc, presumably down to the prohibitive costs. It thankfully is possible nowadays to bring these circuits into instruments largely thanks to the availability of good analogue multiplier and divider ICs. The primary oscillator in this circuit is effectively a wavetable core, to borrow the obsolete digital paradigm for analogy. In physics terms it is a differential equation solver, the Legendre equation in fact. Paul Schreiber mentioned this as being the overriding theory in the wavetables in the E350, and I couldn't resist looking into it, given the sound and timbral possibilities of that module. Luckily this equation has some very useful and interesting properties that make me feel slightly more justified in following a pat of least resistance to get to this point. From the work leading up to the main function generator, I had some subcircuits that together made a sin oscillator that has a lower distortion than can be measured by an HP8903 distortion analyser, and paired with a simple waveshaper, I thought this would be handy to have on board as a dedicated modulator for FM. Valence electrons, are you tired of the same old energy transfer in consumer electronics, nuclear reactions, static electricity, lobotomy operations? Why not make your next bond in an analogue synthesizer. We promise you a fully buffered low leakage experience as you and your co-charges turn a theoretical concept into a physical process. Simply follow the path of least resistance at your nearest conductor or semiconductor today! That's a lot of multipliers. I like your IC choices. This board (the sin modulation generator) has 5 multipliers. It might seem like a lot but compared to similar designs, (the oscillator in the HP8903 analyser, say) this design is far more concise. That one samples the peak amplitude of the sine using the zero crossing of the cosine, and effectively squashes it, as well as being too slow to respond to new changes in pitch to use as a variable audio frequency generator. This design monitors the sine in real time and feeds back a signal corresponding exactly to the deviation away from a perfect waveform (thanks, maths! ), and nothing else. So for all measurable purpose it is as close to zero distortion as physics will allow. The primary oscillator has 6 multipliers, and a dual comparator functioning as 2 time division multipliers. So that's 13 total! A few different screen grabs of different waveshape settings in the primary oscillator, where there are 2 analogue controls, for Degree and Order (might need to think of less technical names for them). The oscillation is stable, but it needs some reset circuitry to keep things perfect. According to the textbooks the Legendre equation resets to zero (with non zero order values) every single cycle, which would be great, but actually depending on degree and order settings the reset period is once every 2 cycles, once every 3, etc etc. So I need to design some quite intelligent logic circuitry to dictate correct reset timing. but actually depending on degree and order settings the reset period is once every 2 cycles, once every 3, etc etc. It turns out this isn't true, what the circuit needs is extremely tight accuracy, which is quite complex as there are effectively 3 oscillators running in sync, as well as a potential divide by zero error at the + and - 1 singularity. But, the singularity is not quite as scary as some physicists believe, what you need to do is look at the equation from both sides. A sine wave has a divide by zero error underlying it's theoretical foundation (e.g. tangent ), but actually it's the most perfectly stable waveform. The Degree and Order controls are now done with proper multiplication which means they will be good for audio rate modulation as well as more typical DC control. Very intersting, keep up the work. Hey thanks very much... big shoes to fill! I should at this point mention my gratitude for the immense guidance given by Graham Hinton, I'm proud to say that this design is quite unlike anything that has appeared in a synthesizer before now, and Graham has placed some very helpful signposts along the way. Thankyou! Nice! I too have gotten input from some great designers for a few of my projects. It's really quite cool to get input from someone like this. Following your project with great interest.